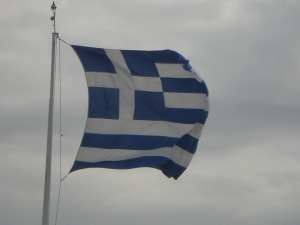 Following major surgery in September 2012 for Mesothelioma (Cancer of the Lining of the Lung) and two courses of chemotherapy, I was anxious to have a break from treatment in order to undertake a pilgrimage in Greece. I approached this journey of a lifetime with mixed emotions. On the one hand I was excited at walking in the footsteps of the greatest missionary of all time and on the other hand there was some trepidation at the challenge presented by the distance to be covered from the North of Greece to the South. Would I be able to achieve my goal? Would the uphill climbs to Delphi and the Acropolis be too much and leave me gasping for air? These were some of my thoughts as I made my preparations. From our first base in Kavala ( the ancient port of Neapolis) in the North of Greece we made the first of many early starts whilst it was still cool to visit Lydia and Philippi. 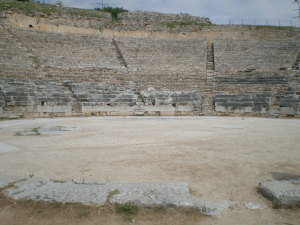 Lydia is the site of a stream where the first recorded baptism took place. Philippi is a site of many archaeological ruins including an amphitheatre and is the site where Paul was imprisoned. 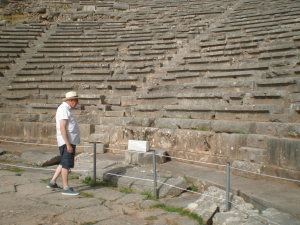 The ascent to the amphitheatre in the blazing sun was demanding and challenging but very worthwhile. We then travelled to Thessaloniki for an overnight stay and a visit to Berea where Paul stopped after escaping from Philippi and Thessaloniki. This was followed by a dramatic drive into the mountains to visit a modern monastery where young nuns lead a self-sufficient life and make their own cheese, honey and other produce. 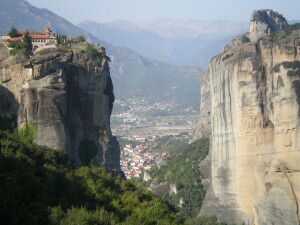 That night we stayed at Kalambaka which nestles at the foot of gigantic rock pinnacles. The next day was demanding as we climbed up and down steps to visit two monasteries perched high on top of these incredible granite rocks. At times I did have to stop and catch my breath but other people in the group were supportive and encouraging and I reached the top in the end! 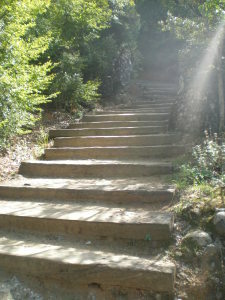 Steps up to and down from the monasteries were very challenging for me! 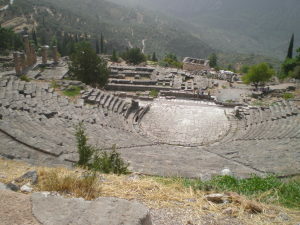 The sixth day took us to Delphi, an ancient site that clings to the slopes of Mount Parnassos. It was a place which in days gone by attracted pilgrims from all over the Hellenic world and it was here that the Oracle was consulted by both state and individuals. This was the greatest challenge for me by far. The angle of the slopes and the extreme heat that day were gruelling but little by little I reached the mighty amphitheatre and stadium to be rewarded by the most incredible views of the valley below. Delphi and the view from the top! 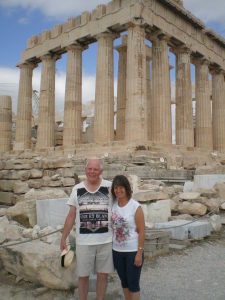 The final part of the journey took us to Athens and a full day tour which included a climb up to the Acropolis and the Parthenon. It was hot and crowded and involved climbing many steps. On the way down we stopped at the site of Mars Hill (Areopagus) where Paul received a very mixed reception! 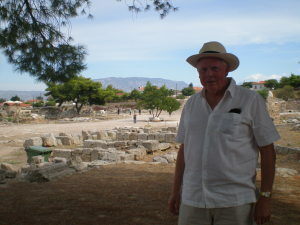 We then visited the Agora, the centre of public life in Athens at the time of St Paul. 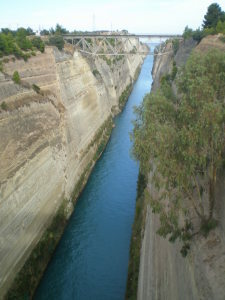 On the final day we travelled to Corinth and crossed the Corinth Canal which connects the Aegean and the Ionian seas. Paul spent much time at Corinth and his thoughts and writings can be found today in the New Testament. We stood on the beach at Cenchreae where Paul set sail for Ephesus in Turkey and realised that it was time for us to return home too. It is difficult to summarise this experience but it was profound and it has enabled me to link the previous knowledge and understanding that I had with actual places. The nature of the distance covered every day was demanding. I will treasure many memories of my time in this special country. I would like to place on record my thanks to the charity Challenge Cancer through Adventure for all the help which enabled me to achieve this once in a lifetime experience. Graham standing at the ancient ruins of Corinth and a view looking down into the Corinth Canal.